Special Containment Procedures: SCP-2305 is to be contained in a standard high-value storage locker in Site 68. Once weekly, a Foundation researcher is to record the SCP-2305-A instance currently displayed, and archive it onto a secure Foundation server. SCP-2305-A neutralization methods are not to be attempted without the approval of a member of the O5 Council. Description: SCP-2305 is a sheaf of US Letter papers, stapled on the top left corner. 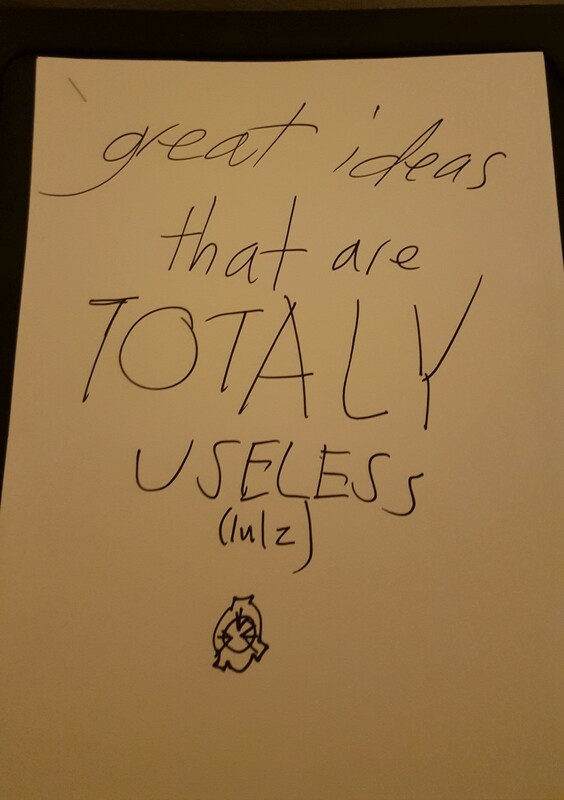 Written on the front page in black permanent marker are the words "great ideas that are TOTALY [sic] USELESS" in large letters. Below in smaller text and parentheses is the word "lulz",1 as well as a crude hand-drawn image of the Foundation's insignia. 1. A description of a potential method by which to neutralize a Euclid or Keter-class SCP object, typically going into great detail as to how, when, and where to execute the neutralization. The SCP objects selected for neutralization have no consistent pattern in origin, location, anomalous properties, or level of danger: SCP objects appear to be selected at random. Attempts to temporarily reclassify SCP objects selected to Safe status have no effect on the documentation. 2. An incident log detailing an attempt to neutralize the SCP object in the manner described in #1. In all cases, the attempted neutralization will completely fail or otherwise backfire, typically at great cost of personnel and assets to the Foundation. 3. A brief section following #2 entitled "The moral of the story." This section varies widely in content, ranging on subtle commentaries on the attempted neutralization to anecdotes, pop culture references, or insults directed at the Foundation. SCP-2305 has no effect on reality; all documented neutralization attempts appear to be completely fictional. However, if an attempt is made at neutralizing the SCP object subject to 2305-A documentation using the method described, said attempt will fail in a near-identical fashion as described in the 2305-A documentation. Minor variations on the neutralization method have yet to yield successful results, despite numerous attempts; to date, SCP-2305 has yet to provide any useful information on how to neutralize SCP objects. For this reason, testing of SCP-2305-A documentation is generally discouraged. "The moral of the story:"
Proposed Neutralization Method: SCP-499 would be terminated in accordance with standard humanoid neutralization protocols, and would be replaced by an automated machine capable of moving SCP-499-2 at the same rate that SCP-499 previously did. Result of Neutralization Attempt: Throughout the world, the sun is perceived as having not moved from its original point in the horizon, despite SCP-499-2 being moved. Normal day/night cycle continues, and astronomical observations indicate the rotation of the sun and earth are not affected, but the sun is nevertheless perceived as unchanging and unmoving by all human beings on earth. Cover-up measures prove ineffective at preserving normalcy and secrecy. Proposed Neutralization Method: A modified reality distortion effect would be used to significantly slow down all hands on the clock, to the point where none of its predictions would come to fruition, thus de facto neutralizing it. Proposed Neutralization Method: SCP-1138 would be simultaneously held by four separate persons: an American biologist who identifies as an atheist and an epicurean; a theology professor and Christian apologist; a Buddhist monk; and a severely mentally retarded man with a tested IQ of 67. It was theorized that the vastly conflicting worldviews of the four persons would result in bringing SCP-1138 to its true "neutral" form. Result of Neutralization Attempt: Upon touching the book, all four individuals simultaneously suffered massive brain aneurysms; all subsequently died within 12 hours. SCP-1138 permanently transformed into a book entitled "The Triumph of the Unreal," attributed to an author named "SCP-1138." In the book, it is proclaimed that the Foundation's mission to preserve normalcy is hopeless and that the anomalous world will eventually become known to the public and impossible to contain. From then on, SCP-1138 displayed a new anomalous effect: any person reading its contents becomes convinced its thesis is correct, and becomes strongly opposed to the existence of the Foundation and other organizations designed to safeguard humanity from the anomalous. Proposed Neutralization Method: "Assassination" of SCP-1679-1 via point blank sniper rifle shot to the head. Result of Neutralization Attempt: Immediately after SCP-1679-1 was shot, vital functions for all residents of SCP-1679 immediately ceased. Despite the apparent deaths of everyone in the town, utilities and other essential functions continued to operate normally, as if the residents of the town were still alive. Several weeks later, it was found that, when left unobserved, residents of SCP-1679 would move throughout the town, often "frozen" in positions that mirrored their typical daily routines. Proposed Neutralization Method: Mobile Task Force Beta-10 ("Time Hoppers") is dispatched into SCP-2135 equipped with a nuclear warhead; Beta-10 is instructed to arm the device and return to baseline reality via SCP-2135-A. Result of Neutralization Attempt: Members of Mobile Task Force Beta-10 return to baseline reality deceased and in various states of dismemberment. The nuclear warhead returns armed; SCP-2135-A does not leave 91st Street Station, and Foundation agents are unable to remove it. Three hours later, the warhead detonates, destroying the island of Manhattan and causing a breach of secrecy for the Foundation. Proposed Neutralization Method: POI-2190-2 and POI-2190-3 would be forcefully separated and administered Class A Amnestics; POI-2190-4 would also be administered Class A Amnestics and placed into foster care. Result of Neutralization Attempt: SCP-2190 remains dormant for approximately two weeks after POIs 2190-2, 2190-3, and 2190-4 are separated. After this time, approximately 40% of cell phones in the Philippines are simultaneously flooded with calls coming from SCP-2190, with the content of the messages consisting of SCP-2190 crying and profusely apologizing for separating POI-2190-2 and POI-2190-3, claiming it "made a mistake". In addition, SCP-2190 refers to the Foundation by name and describes it as a "horrible, horrible group of people," causing a breach of secrecy that was significantly difficult to cover up. Proposed Neutralization Method: Unique among SCP-2305-A instances, this instance produced several hundred proposed neutralization methods, resulting in SCP-2305 becoming over five hundred pages long for the duration of this instance's manifestation. These proposed neutralization methods ranged from the simple (setting the Lees' house on fire) to those already attempted (bulldozing the house) to extremely complex methods of destruction using a number of highly classified ██████ SCP objects. As is the case with the Foundation's current record of SCP-2740, and again uniquely among SCP-2305-A instances, there is no record of the results of these neutralization attempts. "The moral of the story:" U mad, bro? For additional logs of SCP-2305-A manifestations, please consult SCP-2305-A Extended Documentation Log (Level 3 Clearance Required). 1. Corruption of the Internet slang term, "lol", which stands for "Laughing Out Loud"; generally used to express bemusement, mockery, or contempt. 2. To view the unabridged versions of these logs, contact Site 68 Director Selvece. 3. This is a quote from William Shakespeare's Macbeth, with "eyes" standing in for the original wording "face."